Greece had us at ‘hello’! Both Duncan and myself had been to Greece a few times before we met, but I never visited any of the islands until we decided to do some low-key island hopping in the summer of 2012. We loved it so much that by the time we boarded the plane back we were plotting to sell up and move there. A year and a half later we did just that. We lived on the Greek island of Paros for four years. Although we decided to move back to the UK for a whole host of reasons, Greece still has a special place in our hearts. It gave us (especially me!) a completely new lease of life (Paros was where this blog was born) and provided a much needed reset and clarity on what we both want from life. As it’s such a popular holiday destination, I bet heaps of you have been to Greece and, as it’s impossible not to, loved it! So I figured it’s time I veganised Greece’s national dish (no, not gyros or moussaka although I’ve tackled them both already 🙂 ). 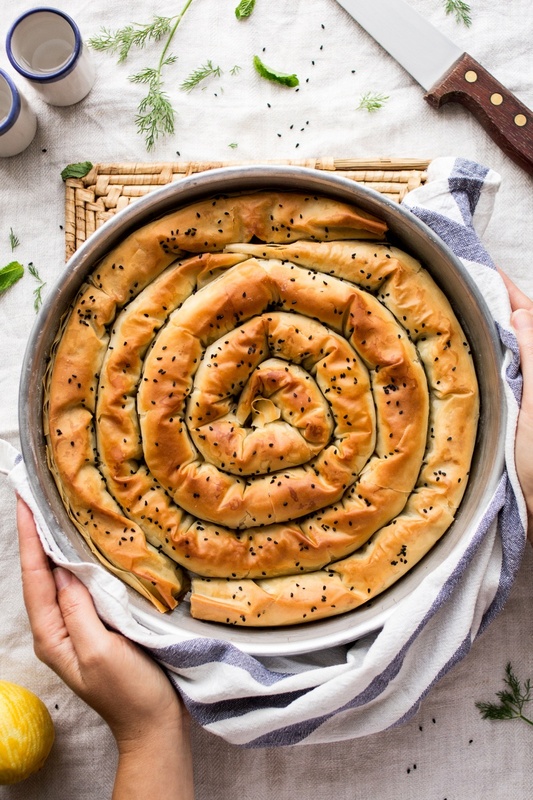 I am talking about an all round crowd pleaser – Greek spinach pie, to the initiated (i.e. the Greeks and Greek aficionados like myself) known as spanakopita! If using the tofu option, crumble the cotton tofu into a large mixing bowl with a fork. Mix in the silken tofu. Season with a bit of salt and lemon juice – you can always add more later when you mix in the spinach. If using almond feta, it needs to be made a day ahead. I simplified the ingredients for this recipe as there are a lot of other flavours going on, but the method remains the same – please follow the method in this recipe. You will need to blend the feta mixture the day before and drain it overnight. You can bake it on the day you assemble the pie, but make sure you allow it to cool down before adding it to the filling mixture. Bake for about 75 minutes as it is a double portion. Cook the spinach by either blanching it in batches for about 40 seconds and then plunging it into a bowl of ice-cold water (to stop it from cooking any further) or by sautéing it in a frying pan in a good splash of water. Once the spinach is cooked, allow it to cool down completely and then wring it dry (that’s very important as otherwise the pie will be soggy). I simply used my hands to squeeze all the water out of the spinach in small, palm-size batches. I am very diligent about it as spinach retains moisture like nothing else. Chop the spinach finely after it’s been wrung dry. Heat up a tablespoon of olive oil in a small pan, gently stir-fry the spring onions and garlic until softened and fragrant. Cool them down before adding them to the filling. Mix the ‘cheese’ mixture, chopped dry spinach, lemon zest, mint, dill, parsley, nutmeg, black pepper, softened garlic and spring onions together in a large bowl. Mix them all really well with your hands. Taste the mixture and adjust the seasoning as required. Preheat the oven to 160° C fan / 320° F fan (or 180° C / 355° F without a fan, although I recommend using a fan if your oven has one – it helps to crisp the pastry up) and grease a round tin or a baking tray with a bit of olive oil. If you don’t have a tin the right size, do not worry, use a large baking tray – this pie is pretty self-contained. To assemble the pie, clear a large area of your work bench to make room for a long row of pastry sheets joined together. Keep the thawed pastry sheets protected by a damp kitchen towel so that they do not dry out and become brittle. Place a rectangle of pastry in front of you, making sure the longer side is parallel to you. Then place another rectangle to its right overlapping the ends by 5 cm / 2 “. Follow up with the third sheet arranged in the same manner. You should end up with a very long rectangle of pastry. Using a pastry brush, quickly grease the entire area with a bit (not too much) olive oil and double all the pastry sheets overlapping them in the same manner. Follow up with another layer of pastry (if you want and have enough pastry sheets, it’s not necessary). Brush the entire area with a little bit of oil again before arranging the filling on top. Put a long snake of filling along the longer edge of the pastry leaving a 5 cm / 2″ margin at the bottom. Try to make the filling amount the same everywhere. I weighed my entire filling (710 g / 25 oz) and then divided it into 5 (this recipe spans a total of 5 sheets wide of phyllo pastry to fill a 26 cm / 10″ diameter pie dish) 142 g / 5 oz portions. Starting from the bottom, gently roll the pastry into a long snake. Gently coil the snake, seam down, and place in the greased baking tin. Repeat steps 8-10 with the remaining pastry, but the second time round simply overlap two (not three) sheets of pastry side by side. Nest this new coil in the tin tucking its beginning onto the end of the first coil. Brush the pastry with some more olive oil and sprinkle with seeds for garnish. Bake for approximately 45 minutes, until golden brown. Allow the pie to ‘set’ after baking before cutting into it. Store the leftovers in the fridge for 3-4 days. *The difference between silken and cotton tofu is explained neatly here. **I used Jus Roll Phyllo pastry. Each packet has 7 sheets of the following dimensions: 25 cm (10″) by 45 cm (18″). The sizes of pastry sheets vary depending on the brand, but you’ll still be able to use this recipe as guidance. 0 Response to "VEGAN SPANAKOPITA – GREEK SPINACH PIE"